You'll be £10.00 closer to your next £10.00 credit when you purchase A Bomber Crew Mystery. What's this? After having discovered a discarded trophy in an Edinburgh antiques shop, author David Price endeavoured to uncover the stories of the men whose names had been engraved upon it. Praised as 'Outstanding Crew of the Month', the members of 388th Bombardment Group set out on their very first mission on D-Day. This baptism of fire heralded the start of an illustrious career; in the period between August-September 1944, they took part in over 30 missions. And yet the details of their endeavours have largely been forgotten. Having become disconnected from its previous owners and therefore its history, David Price has made it his mission to retrieve this relic from obscurity and to provide it with a platform upon which it can be appreciated widely. The history of 388th Bombardment Group's service is told in great detail by Price, who has actively sought out each member of the Group, together with surviving family members, in an effort to glean more information about their war and to reunite them with the trophy that they won in the midst of it. The resulting book serves as a poignant and evocative tribute to the Group, as well as to the wider allied effort during the Second World War. I would highly recommend those interested to add a copy of “A Bomber Crew Mystery” to your collection and let the roar of the engines propel you back into a time and place well worth exploring. Had to have this book. My Father, Louis Panther was the pilot of the B-17 Vagabond Lady and is mentioned in the book along with the circumstances that took place when he was shot down and taken prisoner. He was stationed at Knettishall with the 388th Bombardment Group, 561st. Squadron. He stayed in the Air Force after the war and was stationed at RAF Sculthorp England flying B-45 jet bombers with the 49th Air Division, 47th Bomb Wing. We lived in Aylsham for two years and he took us to Knettishall twice. Of course in the 50's there was much more of the base to look at than is left today. 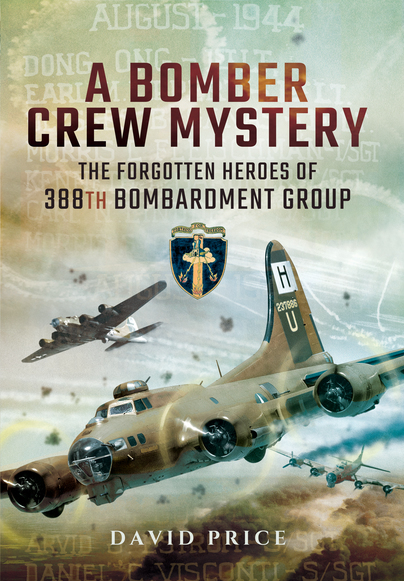 If you have a family member or knew someone who was a member of a B-17's crew, you will love this book. David Price did a great deal of research and gave a very exacting account of two crews of the 388th. David Price has been researching and writing about aviation for many years and has contributed a number of articles to newspapers and magazines, including Flypast. He is currently the Director of Solway Aviation Museum and has served as Chairman and MD for Solway for eight years in total. He writes and lectures on military aviation and also the First World War in local history groups in Cumbria.